history of the America\Australis part 2. A New Name-A New Life. 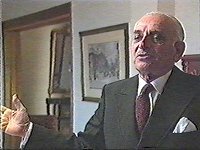 Demitrios Challioris explained how his career with Chandris had started. "I was in charge of a crude oil tanker in Southampton, so we were having a reception with guests from the Chandis family on board. We heard a voice asking us to go outside, wondering what was out there, we went and I saw the America of the United States Line" Anthony Chandris said to Demitrios "How would you like to be the Captain of that ship? "Demitrios naturally replied "I would like it very much, but you don't have any ships like this!" Anthony then said "I am going to buy that ship" and he did! So this is how Demitrios Challioris became the first Master of the ship under the Chandris flag...unbelievable but true. Demitrios continues describing his Captains role. "Being the Captain on such an enormous cruise liner was a very demanding job. Every morning you would have to go out onto the deck, greet the passengers, kiss their foreheads, listen to their wishes...and complaints. Very often I was with my wife, strolling together on the deck, so I could easily approach a pretty woman and talk to her, pay her a compliment and she would say, "Captain would you invite me to your table tonight? "Madam, consider yourself invited". "There were also other problems for me as a Captain. For instance the Panama Canal was just wide enough for the size of the ship. When going through the locks there was barely one metre left on each side. It was a very tough and stressful situation, and there were around 8-10 locks to travel through". The Australis set off on her first voyage in August 1965. 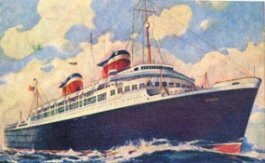 Thereafter, her customary routing was on three-month voyages around the world: Bremerhaven, Rotterdam, Southampton, Casablanca, Las Palmas, Cape Town,(or through the Mediterranean via Gibraltar, Naples, Malta, Piraeus, Port Said and Aden), Freemantle, Melbourne, Sydney, Auckland, Suva, Tahiti, Acapulco, Balboa, Cristobal, Port Everglades and return to Southampton. She also cruised on occasions from Southampton to the Canaries, Portugal, Spain, West Africa and sometimes into the Mediterranean. The prices were just right for the times e.g. in September 1972 just £84 for a fortnight from Southampton to Barcelona, Tangier, Gibraltar, Lanzarote, Tenerife, Madeira and Lisbon. Chandris Lines had the Australian Government's prized migrant contract, bringing scores of new settlers(who paid as little as £10 each) out to Freemantle, Melbourne and Sydney. This usually meant that she was "sold out" to every last berth(and especially with families and "shares" in the larger 4 and-6 berth cabins on the lower decks). One staff member later recalled, "those outward sailings were often so crowded that we had to have three sittings for dinner and usually one just for the 500 or so children that might be onboard." During 1967 Australis when bound for Australia, was diverted from the Suez Canal transits to a more southerly passage which was to include calls at Las Palmas and Cape Town. 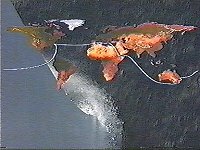 Once the Arab-Israeli conflict was ended Australis again voyaged (during February 1976) by the Suez routing. 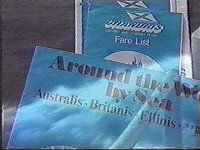 In the meantime P&O had ceased the line-voyage operations by Canberra and Oriana in 1975, causing Australis to be awarded the title of "the world's largest express liner" in regular scheduled service. Externally Australis underwent many alterations during her career with Chandris. The most obvious was the 1969 removal of her main-mast. In lieu, a short mast was fitted atop her aft-and functional-funnel along with a box-like structure deemed neccessary to disperse exhaust smoke. Also during those years extra passenger capacity was built within the shells of larger stateroom accommodation. However, her imposing public rooms remained basically unchanged. Aboard Australis were perhaps some of the greatest surviving examples of 'American Moderne'decor to exist in the seventies. The ships many murals, bas reliefs, her lacquer-work, add bold-yet intricate-Art deco floor coverings were evidence of that `tween-wars era when style and elegance really counted. Apart from the various signs by the stairs and public rooms, vestigal remains of the America era that were still very much in evidence were Pierre Bourdelle's 24 lacquer panels in the Atlantic restaurant and Hildreth Meire's chrome and copper reliefs in the Pacific restarant. On all stairways Austin Purves' sculptured aluminium zodiac motifs remained the principal artistic features. In the ship's Cocktail Lounge Constantin Alajalov's three murals on the ceiling depicted the liner's passenger's life by day and night activities. Beneath each mural the International code flags spelt `America'. Chandris Lines, like P&O and many others before them, had realised the unprofitability of maintaining such a large liner upon a slow and diminishing market. 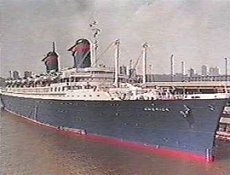 Following Lloyd Triestro's cancellation of Galileo Galilei and Guglielmo Marconi voyages, The Australis had become the sole remaining liner on the trade. Chandris Lines had just over a decade of extremely profitable services on the Australian trade route. By 1977, howerver, Chandris had lost the Government contract (thereafter new settlers would go by jet plane). and so, that November, she made her last voyage out to Sydney. Then she was laid-up at an anchorage in rather remote Timaru in New Zealand. There was uncertainty, just as there had been in 1964, about her future. Some believed that she would make only one further voyage: to the Far East and those ever-hungry scrappers at Kaohsiung Taiwan. 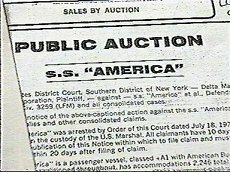 In the spring of 1978, however, and with the hope of cashing-in on the booming short cruise business out of the US East Coast ports, particularly New York, several American investors offered to buy the idle Australis for $5 million. The offer was promptly accepted and so she was "steamed up" and sailed via Panama for New York. Once there, in late May, she was sent to the big graving dock in Bayonne for inspection. The hull and machinery were said to be in fine condition-in fact the words "amazing" and "excellent" were used by several experts. It was a great testament to her original construction some forty years before. Otherwise, little else was done. The investors were satisfied and, once again, the sales contracts were signed. Then, the new owners decided to rename her America, to capitalize on the ship's illustrious heritage. The new operators were even listed as American Cruise Lines, but then a small, Connecticut-based operation, which ran coastal cruise ships, objected in court and so the America's new owners were soon relisted as Venture Cruise Lines. The schedule of short cruises-3 days to "nowhere", 4-and 5 day trips to Halifax and 5-day runs to Nassau-had barely begun when there were problems, in fact very serious problems. They seemed rather inevitable. She was berthed at Pier 92, at the foot of New York's West 52nd. Street. In early days, that terminal had been used by Cunard, but was now part of a six-berth consolidated cruise centre. Once passengers were aboard, most noticeable was the ship's near filthy condition: small mountains of soiled linen and masses of well worn mattresses, scattered bundles of rubbish and, just about everywhere was a stale stench-a foul mixture of kitchen odours, engine oils and plumbing backups. Evidently, there had been some run down and deferred maintenance even in her final Chandris passenger days. It seemed so inappropriate for a once sparkling liner. The outer decks were also in deep decay, suffering from the ill effects of long overdue care. There was rust, leaking water from overhead pipes and even holes caused by corrosion in the "dummy" forward funnel. Noticeably, there were far too many layers of paint slapped over the outer bulkheads, on the rails and-most alarmingly-on the davits and lifeboat gear. 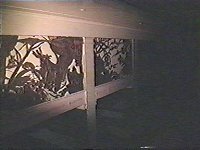 College students, employed at minimum rates, had carelessly painted some of the Public rooms, the once impeccable stainless steel trims were scarred by brush strokes. Most obviously, the ship needed weeks, if not months, of proper care-and all of it conducted at a proper shipyard. Alternatively, it seemed that she might best be sent on to the scrappers. On the 30th June, however, and booked with some 900 passengers that responded to the overly enthusiastic, high spirited newspaper advertising by Venture Cruise Lines, and by the $75-a-day rates, followed with horrific reports of inadequate food, plumbing problems, ill-trained staff, uncleanliness and, perhaps most damaging, reports of cockroaches and even rats seen throughout the passenger areas. Somehow, she managed a second cruise, a 5-day run up to Halifax, but the same complaints followed-and along with reports of rubbish being stored in the outdoor pool. The old America was defaced and ruined completely. Her owners had already incurred over $500, 000 worth of fines. Promptly, Venture Cruise Lines closed their doors and declared bankruptcy. The worn-out, scarred America spent the remaining weeks of that summer at her pier 92 berth. Some onlookers occasionally thought of her earlier days, of better times for the ship, of those colourful and splendid gatherings of Atlantic liners along "Luxury Liner Row". In late August, the New York City Bankruptcy Court Marshals and their agents went aboard and, in view of her debts, auctioned-off the 38-year-old liner. Surprisingly, the buyers were Chandris Lines and the price was an amazing $1 million, or $4 million less than the amount for which they sold her four months earlier! A skeleton crew was mustered and, on the 6th. September 1978, largely unnoticed, the America slipped out of New York, certainly for the very last time, bound for Piraeus. The ship was, once again, moored in Perama Bay, in those extraordinary, but haphazard anchorage's and nestings of ships owned by Greek shippers. Some of her neighbours at the time included several well known passenger ships: the Chandris Ellinis, the former Norwegian American Bergensfjord, the Greek Line Olympia, Furness Bermuda's one time Ocean Monarch and, amongst them the oldest of all, Grace Line's Santa Paula of 1932. There seemed to be little hope for many of these ships, but there was some further repairs made to the America and then-with her forward funnel gone in the process-she reappeared as the Italis. She was advertised as the "Italian lady" for charter Mediterranean cruises out of Barcelona and Genoa. but this too was short-lived. By the autumn of 1979 she was, once again, out of service, so went back to her moorings in Perama Bay. Her commercial days seemed to be over. the old ship had been in decay, lonely and rusting, there had been the inevitable rumours, of course, as with the one-time fleetmate United States, which has been laid-up and equally neglected on the other side of the Atlantic. There was reports that the America would become a floating hotel in a West African port, then a "floating prison" at Galveston, Texas and even one wildly enthusiastic report that she would return to New York waterfront, but as a restored "luxury hotel"-the Hotel America! In May 1980, she was sold to the Inter Commerce Corporation, a Swiss-backed arm of the Panamanian-flag company Noga d'Importation et d'Exportation. Then renamed Noga, she remained at her Greek moorings. Silver Moon Ferries Ltd were her new owners in 1984, renaming her Alferdoss (Which meant "paradise" in Arabic). Her end nearly came in October 1988, when one of her underwater bilge pumps rusted through, flooding the engine room and causing her to list to port. She was ultimately beached and pumped dry. Later a scrap merchant offered $2 million for her. After the owner had accepted $1 million as a deposit, a team of workers came onboard and began dismantling. However, the scrap merchant defaulted on the balance, demolition work was halted and the old America cheated fate once again. The ex-"Australian Lady" was laid-up in Eleusis Bay, Greece from 1980 until she was sold in 1992. The above two pictures were supplied courtesy of Lia and Aris Bilalis. Miraculously, in October 1992, after almost 12 years in lay-up, Alferdoss was bought for $2 million by a Thai company, to be used as a floating 5-star hotel at Phuket. Renamed American Star, she entered dry dock for a period of 68 days to allow workmen to fully prepare her for the long tow (View photos, sketches and plans from 1993), which was expected to take 100 days, with an average speed of 5.5 knots. The Ukranian flag tug, Neftegaz 67, was contracted to make the giant tow and by the late afternoon of Christmas Eve, 1993, the two vessels left Piraeus roads. Less than 24 hours after departure, due to very bad weather, American Star was yawing side to side and was sometimes overpassing the tug. The vessel returned the day after in the early afternoon, to wait for the weather to calm down and for adjustments to be made to the towing rig. They sailed again on New Years Eve and passed Gibralter on 12 January in perfect towing conditions. It was just off the Canary islands that the weather deteriorated and on Saturday 15th January the tow line snapped. The following day the tug crew succeeded in attaching an emergency tow line. Unfortunately, the bad weather, with force 12 winds, caused the emergency tow line to break. In order to save the ship, Ukranian sailors were sent aboard American Star and tried to connect two polypropylene ropes to the tug. Unfortunately, these also broke and finally the sailors had to be lifted off the liner by helicopter. Early on the 18th January, American Star went aground on the west coast of the island of Fuerteventura and 48 hours later she was broken in two. Declared a total loss, she was left to the elements to finally claim her. Shortly after the grounding, the liner was pillaged by the locals of all fittings, art, brass, and removable wood, and the stern section began a gradual collapse into the water. The bow section has so far held on, defying the elements to this day. Home. | Captain and Crew. | Links. | Tv Documentary. | Chandris. | Memorabilia.